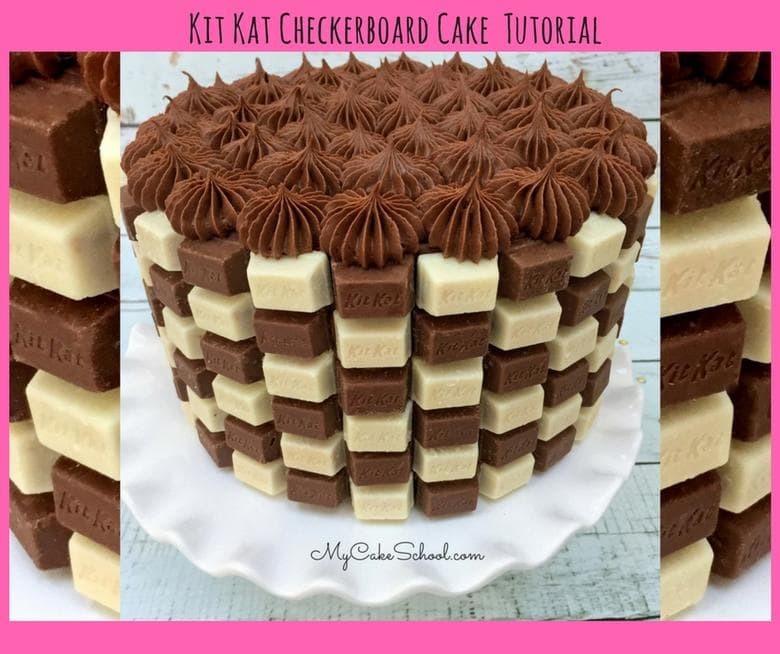 In this quick tutorial, I’m going to so you how to make an EASY and impressive Kit Kat Checkerboard Cake design. 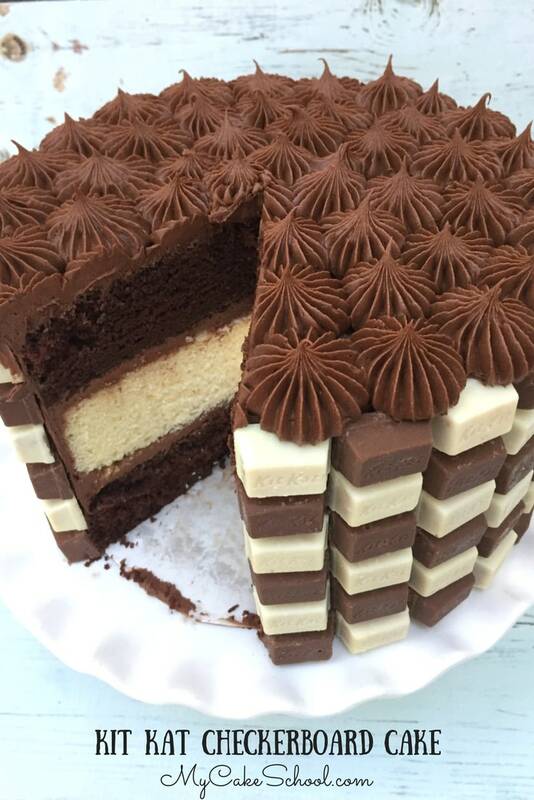 I’ve always loved the Kit Kat Cakes that have been so popular in the past, with standard sized Kit Kats pressed vertically into buttercream frosted cakes (and often topped with M&Ms or other chocolate candies). 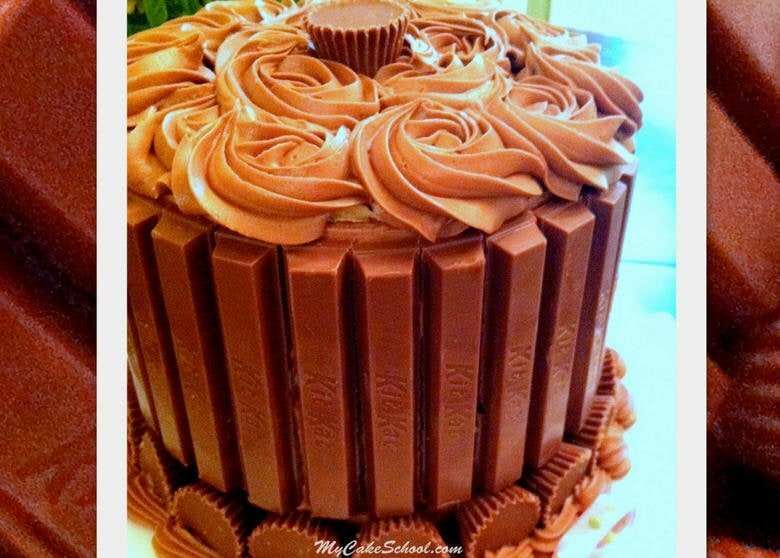 Today’s Kit Kat cake is a fun new twist on this idea. 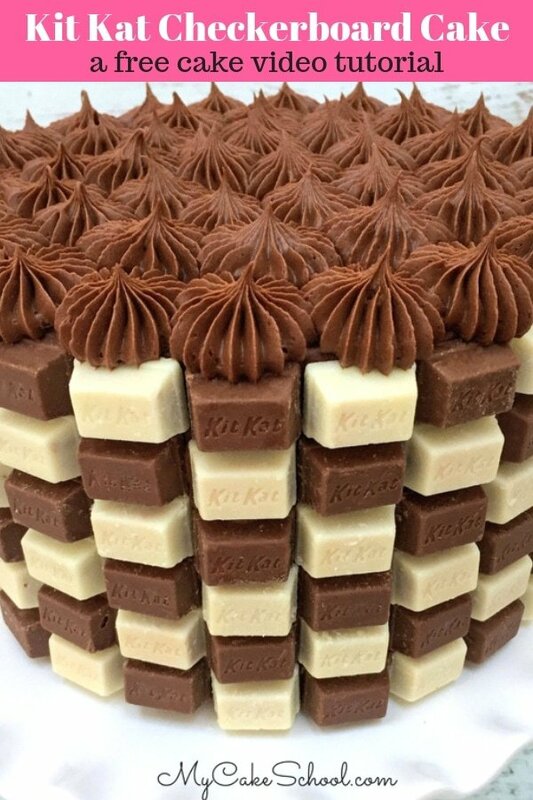 Not only are we using mini Kit Kats, but the contrast of chocolate and white chocolate gives us a checkerboard cake design that is truly unique! The cake that we decorated today consists of two classic chocolate cake layers and one classic white cake layer (8 inch). We have a stash of wrapped cake layers in the freezer that we grab when we need a quick cake, and we decided to go with a chocolate and white theme today. 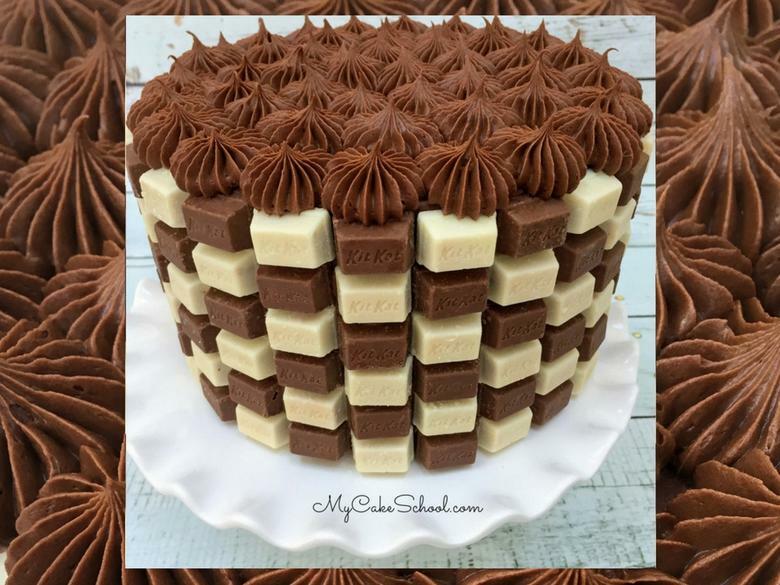 If you want to carry the checkerboard theme to the inside of the cake, check out our tutorial on Checkerboard Cakes from our free tutorials section. This is such a fun effect and no special pans are required! If you don’t have a tip 869, substitute with your star tip of choice (2D, 1M, etc..). Or, you could decorate with rosettes or ruffles! Topping this cake with strawberries or chocolate shards would be nice options too for additional height and color, but we decided to keep it simple! Press your chocolate and white chocolate Kit Kats into the frosting, alternately. Continue the pattern all the way around, creating a checkerboard pattern. If your buttercream crusts, you'll want to pipe squiggles of fresh buttercream to the cake just before attaching your rows. Cover the top of the cake with piped stars. (We used a french tip 869, but you could use your french or star tip of choice. Piped rosettes would be pretty too. *We noticed that sometimes the minis can have little imperfections or look a little dull straight from the bag. It’s not noticeable with the white chocolate mini Kit Kats, but if you experience this with the chocolate ones, simply rub the surface very lightly with shortening to revive the color and smoothness. We hope that you enjoyed the video! If you give this design a try, we’d love for you to share it with us in the comments! I just love quick and easy designs, especially when they involve chocolate! Make sure to check out our collection of FAVORITE cake and frosting recipes in our Recipes Section. Also, you can find more fun & free cake video tutorials here: Free Cake Video Tutorials. Looks great! How lucky are you when they all fit perfect?!! This cake and design is absolutely gorgeous!!! I often use 2 choc and 1 white layer in my 3 layer cakes, and I adore the French tip!!! I will most definitely be making this. The exterior is really cute. Impressive Melissa! 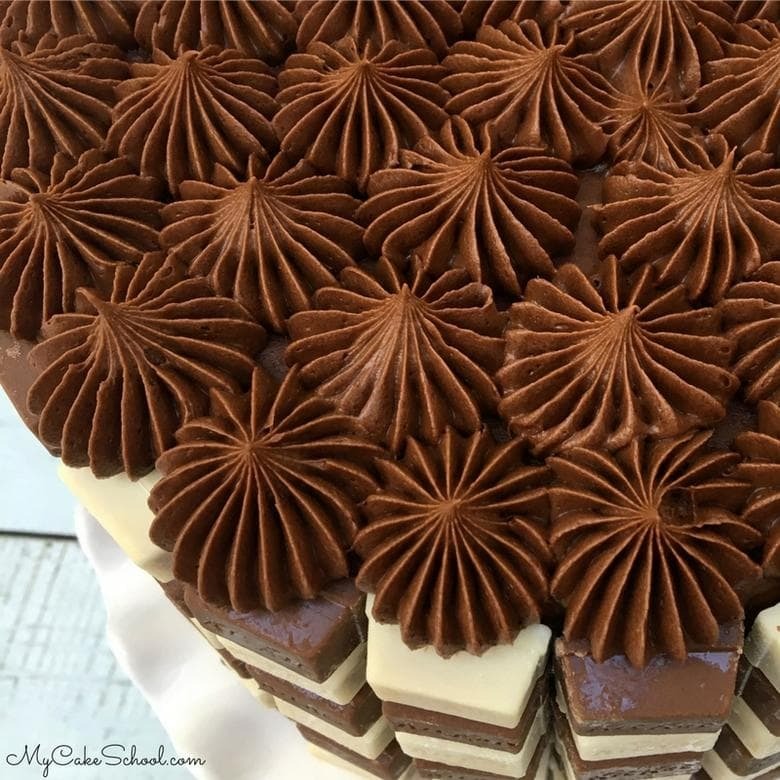 this cake is looking so amazing,thank you for sharing your blog! !